Every month, we zoom in on one of our members to hear their stories and learn more about their businesses in this ever-changing industry. For the month of April, we visit with Robert Van Roo of Palm Springs Safe Access in California. PSSA is a not-for-profit medical cannabis dispensary offering a modern, sophisticated environment for qualified patients to access affordable, high-quality, safety-tested medicine. PSSA strives to be a model corporate citizen, partnering with other organizations to help improve the community’s collective health. Tell us a bit about you and why you opened Palm Springs Safe Access (PSSA)? My name is Robert Van Roo and I’m the co-founder and president of Palm Springs Safe Access. It’s been fifteen years since my first experience with cannabis. Spending most of my youth and adult life in Grass Valley and San Francisco, I’ve been exposed to a lot of friends working in the industry. I’ve seen this medicine change countless lives and it’s changed mine as well. Throughout 2009, President Obama’s speeches struck a chord with me, with clear messages encouraging entrepreneurs to be bold and create new jobs and change. I took this calling very seriously – although I’m sure he wasn’t aiming at cannabis startups. To hone that entrepreneurial spirit, I knew I couldn’t stimulate job growth as a photographer. However, I saw the potential through cannabis. So began my journey working in the California cannabis industry, with the first iteration of Palm Springs Safe Access (PSSA) taking shape in late 2011. 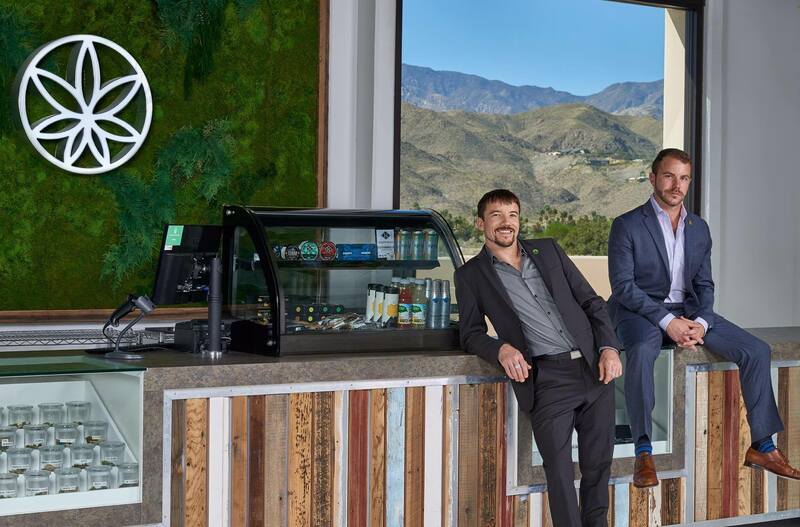 At PSSA we believe when entrepreneurs with the right intentions work with cannabis, it can better the communities in which they operate and someday change the world. The uses of this plant are endless. This industry has the capacity to change lives and create new economic growth not seen in the United States for generations. We understand this is a utopian view, but that’s why Cody Henderson and I opened Palm Springs Safe Access. We did it to create change. 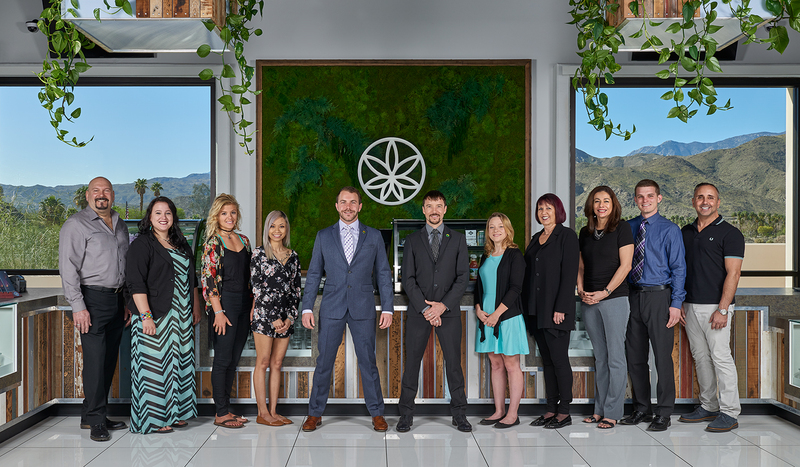 Why should patients seeking medical cannabis come to Palm Springs Safe Access? We believe that our patients deserve an exceptional experience that begins the moment they walk through the doors of our facility and continues when they return home and use their medicine. Steve DeAngelo said it the best: “Out of the shadows, into the light.” I took this statement literally, so we built a well-lit facility with sweeping views of the mountain range here in Palm Springs. Cody and I are both artists by trade, so naturally we had to have a creative and visually stimulating space. We worked with an 8,000-square-foot blank slate, with just concrete floors and four walls with no power. Everything was done in-house, from the interior design to the layout, down to the manufacturing of light fixtures and the finish work. We continued this trend with our in-house cultivation. This ensures best practices and quality control for our patients. When it comes to products we didn’t produce ourselves, we carefully vet sources and individuals, in many instances physically going throughout California to see for ourselves where the products provided to our patients are cultivated, manufactured, and branded. Our patients deserve only the best. Absolutely all our medicine is lab-tested for safety and potency. Independent testing by the City of Palm Springs verifies that we have the cleanest products in the city. Our flowers are nitrogen-flushed and then sealed with Boveda packs inside. All the latest science points to the important roll terpenes play in the medicinal qualities of each specific strain. That makes this collaboration with Boveda, the leader in two-way humidity control, very exciting because early research is already showing that there is 15% retention of terpenes when the 62% moisture packs are present. The packs add moisture as well and since Palm Springs is located in low desert we have to compete with dry conditions. We believe patients should seek out our facility for the exceptional experience and highest assurance of safety that Palm Springs Safe Access provides through the tireless efforts of our entire team. As a business owner, you’re very involved in your community and in causes that you care about. Can you tell us more about what matters most to you, and how your business participates in pushing for progress? When it comes to cannabis, education and knowledge is paramount; we tirelessly work to educate patients, politicians, physicians, and peers in the industry. Lab testing became a benchmark mainly because those seeking the benefits of this plant often have compromised immune systems. Late in 2012, I began educating and lobbying the City of Palm Springs in regard to the importance of lab testing. Last year Palm Springs became the first city to ever contract a cannabis lab and independently test medicine being dispensed in their city. I stay as active as possible with politics on local, state, and federal levels, continuing the conversation with city council members, members of Congress, and senators. We regularly create education and policy reports and actively engage policy makers. On a state level, we participate on both the Legislative and Retail/Delivery Committees with the California Cannabis Industry Association (CCIA) and stay as active as possible with NCIA. In May, I’ll be going to Lobby Days in DC for my second year. When it comes to community involvement, the support of local organizations is key, and PSSA does its part. We are regularly involved with charitable events and infuse local charities and political activism groups with significant donations, support, and sponsorships. We believe it’s our responsibility to be involved in creating change locally. We strive to represent an accurate picture of our industry as active community partners and show what the cannabis industry can do. We contribute as much time as possible to the NCIA Minority Business Council, which aims to create an inclusive and diverse industry respectful of all persons and create unique opportunities to attend NCIA events. This is a huge undertaking and we believe with proper programs in place our industry can provide job opportunities for under-represented and disadvantaged groups and individuals to gain insight on opportunities that are available in the industry. That’s why we support the NCIA Minority Business Council scholarship program whenever possible. Why did you join NCIA? Joining NCIA was the first thing PSSA did when we received our local permit. While PSSA was successful in Palm Springs, the fight for fairness on a state and federal level was clearly the end game. It was the next logical step to take, and we believe it’s our responsibility as a legitimate and responsible member of the industry to support the important causes NCIA addresses. When we joined, we were focused on helping advance causes like fair taxation, access to banking, and sensible policy on cannabis. Since then, NCIA has become so much more than that to us. It’s a community of like-minded cannabis entrepreneurs. We’ve developed relationships with industry peers throughout the country at NCIA events. We’ve expanded our breadth of best practices through the education received at the exemplary NCIA summits and symposiums and have managed to stay current with the ever-changing landscape of the cannabis industry. To make the most out of the Lobby Days experience, register early so that we can begin the process of setting up meetings for you on the Hill. Members who register before April 30th will be entered to win admission and travel expenses for two at NCIA’s Cannabis Business Summit & Expo, including airfare and lodging.